Sana’a: Two months of war have devastated Yemen’s health sector, aggravating a dire humanitarian crisis by depriving millions of people of urgent medical care and threatening outbreaks of diseases like polio and measles, according to doctors and international aid organizations. Medicines, vaccines and basic medical supplies are running desperately low, while hospitals are scaling back services or closing, they say. 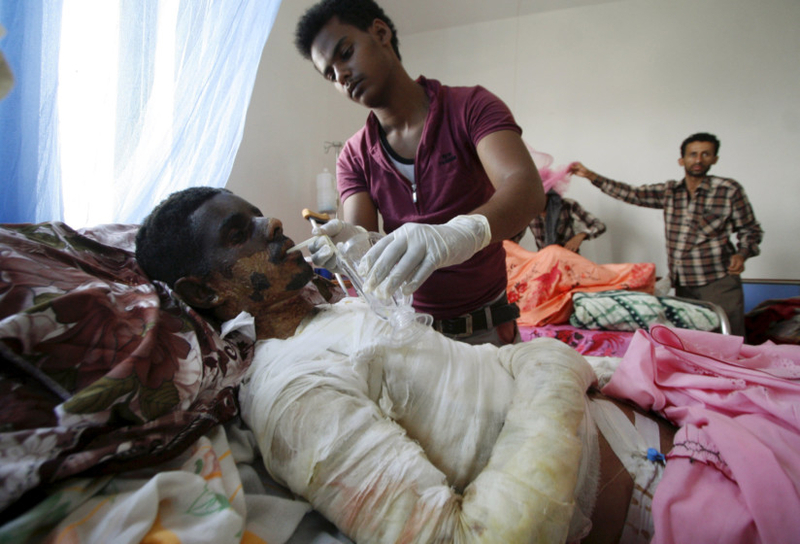 Increasingly, they note, medical facilities are being attacked by warring militias and bombed by a Saudi Arabia-led coalition, which launched an air war against Al Houthi militiamen in late March. “Yemen’s health system is nearing collapse,” said Marie-Elisabeth Ingres, who heads Yemen operations for Doctors Without Borders. The Arabian Peninsula nation of more than 25 million people already struggled with grinding poverty and lack of access to basic health care before the start of the air campaign. The Saudi-led campaign has fueled fighting on the ground between Al Houthis and forces aligned with Yemen’s now-exiled president, Abd Rabbo Mansour Hadi. In February, Al Houthi militants toppled Hadi’s government in assaults that continue throughout the country. Saudi Arabia accuses Al Houthis of being proxies of Iran. Though aid workers are unable to obtain precise data because of the fighting, Ingres noted that the crisis has produced an unspecified, but likely increasing, number of preventable deaths. This includes a 4-year-old boy in a northern province who was unable to receive medical treatment for tonsillitis, Ingres said. “We are quite sure that people are left to die in their homes because they aren’t able to receive treatment,” she said. Since late March, 2,000 people have been killed and 8,000 wounded. During that period, the number of people who require urgent medical care has surged to 8.6 million, the World Health Organization said in a statement released this week . But such care is increasingly scarce because of an inability to access even basics, like obstetrical support during childbirth, the statement said. 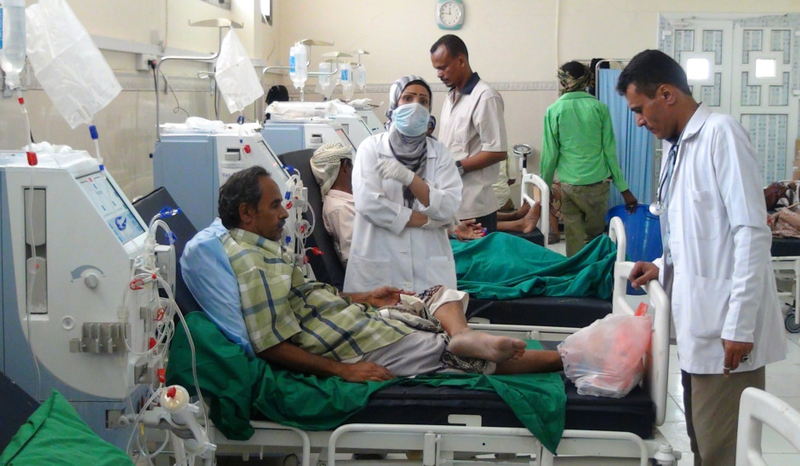 Sadeq Al Jabri, head of the kidney dialysis department at the military hospital in the capital, Sana’a, said that the medical facility can hardly perform basic services. The hospital now focuses on emergency cases and increasingly turns away people because of limited supplies of everything from oxygen and insulin to medicines for kidney dialysis and chemotherapy, he said. Nasser Al Shirahi, 55, was one of the patients turned away by the military hospital. Doctors at the medical facility told the retired freelance construction worker, who has been on dialysis for two years, that they lacked the medicine to treat him. “We’re suffering so much because of this, and we’re afraid our father might die,” said Al Shirahi’s 25-year-old son, Ameen. A major problem for medical facilities is a severe shortage of fuel for generators and transportation. The Saudi-led coalition has imposed an air and sea blockade of Yemen, which doctors and aid organizations say is choking off vital medical supplies as well as food and fuel. Coalition officials say that they allow supplies to come in after determining ships and aircraft are not carrying weapons for Al Houthis. The fighting has damaged electricity plants and power lines that feed most urban centres, depriving communities of power for days. A severe shortage of diesel fuel means that back-up generators cannot power medical centres, causing large quantities of vaccines to spoil in idle refrigeration facilities, doctors say. They also say that the gasoline shortage makes it increasingly difficult for medical staff and patients to get to hospitals. Mareb Al Mahweeti, a vascular surgeon at the military hospital in Sana’a, said the lack of transportation is forcing doctors to take drastic measures. “Because this is delaying their ability to reach hospitals, we’ve increasingly had to amputate arms and legs because these people are arriving with bullet and shrapnel wounds that have gone untreated for so long,” Al Mahweeti said. Since the Saudi bombing campaign began, he has performed ten amputations on war-wounded patients, which he described as last-resort measures. “We could have saved their limbs if they had received treatment sooner,” he said. Ali Al Mudhwahi, a senior adviser at the health ministry, said that a rising number of hospitals across Yemen have been forced to close because of the fighting. This is partly a result of attacks on medical facilities by fighters on both sides of the war. In the southern city of Taiz, he said, militias fighting Al Houthis had “looted” hospitals for medical supplies to treat their own fighters. In the northern province of Sa’ada, an Al Houthi stronghold, medical facilities had been “systematically” targeted by coalition air strikes, he said. “It’s an utter disaster,” he said. Brig Gen. Ahmad Asseri, spokesmen of the Saudi-led coalition, declined to comment on allegations that coalition warplanes are hitting hospitals. He said that he would only address such claims from officials in the Hadi government, which operates in Saudi Arabia. “We do not comment on rebel and gangster declarations,” he said, referring to officials linked to Al Houthi-dominated authority in Sana’a. Al Houthi militants are widely accused in Yemen of carrying out indiscriminate attacks in civilian areas, most notably in the southern city of Aden, which has been ravaged by fighting.